This weeks Bloggers Challenge was to create something using any resist technique. There are a ton of different resist techniques - here I've chosen to use on of the easiest - Versamark Resist. No, your eyes aren't playing tricks on you - I actually brayered two shades of rose onto my card after I left my versamark dry - I wanted my image to have a two toned look. I'm so impressed with your crisp image from the Versamark. What a wonderful card, and I love the two-toned look! Simple, yet beautiful with the two-tone look! Great card! Too funny, I tried this as my first plan but hated the way it came out. Yours is BEAUTIFUL!! This is so rich looking - very elegant! Love it! I love the two toned effect on the focal image. It's beautiful!! This is just wonderful! I love the colors you chose-very elegant looking card...great job with the challenge! Very pretty!! I love card layout too! How pretty...The 2 tone colors are fabulous together. 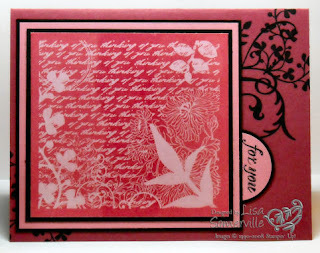 You are certainly getting your money's worth for this stamp set and creating some wonderful cards with it too. Lisa! Please tell me that you sent this on in to SU cause it should make the showcase for sure!!! Beautifully done! All Hail the queen of Fresh Cuts! Just when i think you can't do more than I have seen you do with this stamp, you Rock it again! Love the resist, and it is balanced perfectly with the black stamped image behind it. Man, you rock! Lisa, I love how you take one set and use it and use it. This is so inspiring to me. I am the type of person who makes one or two cards and sets it aside and moves on to the next. You rock and so does this card. Love the two tones of color and the black just picks it up..
Can't wait for my stamp to arrive. Lisa, this is so wow. I love how clean and fresh this looks. This is so pretty! I like the two-toned color combo. Baroque Motifs works nicely with the Fresh Cuts images, too. This card is spectacular! The image is crisp and the two tone is lovely. You've done amazing things with this beautiful stamp set! Congrats on ALL the amazing postings to Stampers' Showcase....I think you've set a record for the most postings with one set in one week! This is gorgeous!! Love how it is a simple technique but the cards beauty doesn't look simple at all! The two-toned look is beautiful!